TIBET CONSCIOUSNESS – RED CHINA – NEOCOLONIALIST. MEGA DAM ACROSS YARLUNG TSANGPO OR BRAHMAPUTRA RIVER IN OCCUPIED TIBET. Red China’s Hydroelectric Dam across Yarlung Tsangpo, Yarlung Zangbo or Brahmaputra River in Occupied Tibet is evidence to establish Red China as a Neocolonialist. Neocolonialism is revival of colonialist exploitation by a foreign power of a nation that has achieved independence. Colonialism is the system or policy by which a country maintains foreign colonies especially in order to exploit them economically. Colonization refers to extension of political and economic control over a nation by an occupying state that has military and technological superiority. Imperialism gets translated into colonizing force. Red China occupied Tibet and is relentlessly oppressing Tibetans to exert pressure to assimilate Tibetans to Red China’s way of life. All India Press Trust of India Updated: October 13, 2015. 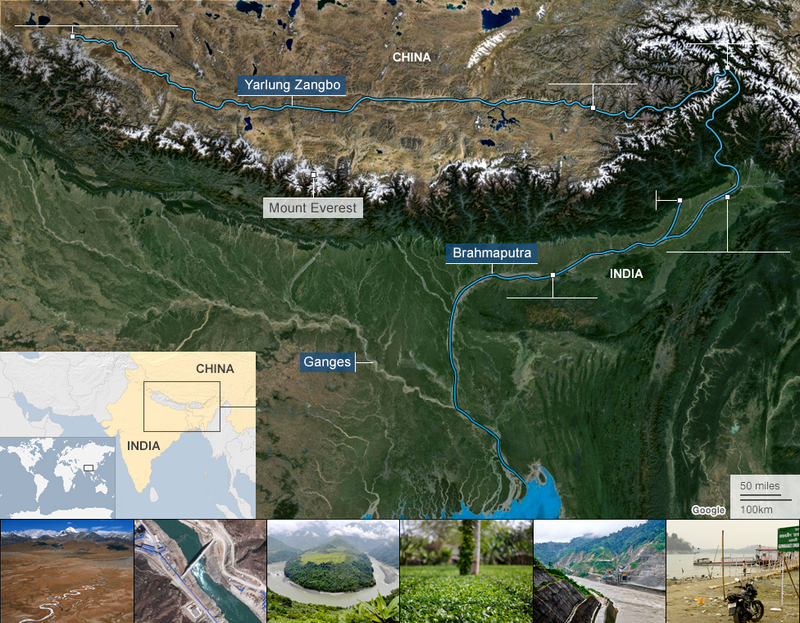 TIBET CONSCIOUSNESS – RED CHINA – NEOCOLONIALIST – $ 1.5 BILLION( 9700 CRORE INDIAN RUPEES) DAM ON YARLUNG ZANGBO, YARLUNG TSANGPO OR BRAHMAPUTRA RIVER IN OCCUPIED TIBET. India is concerned that if the waters are diverted, then projects on the Brahmaputra, especially in Arunachal Pradesh, may get affected. 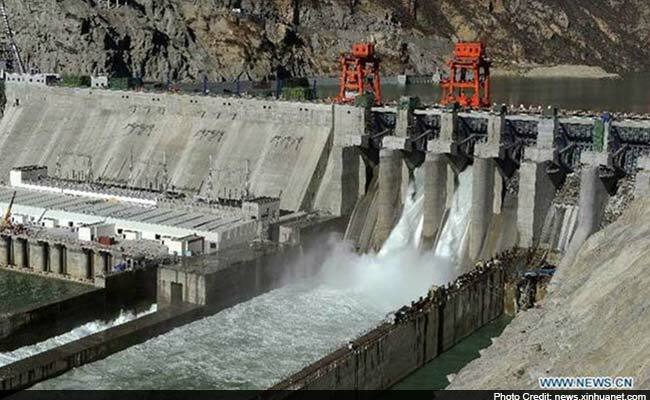 Beijing, China: China today operationalised the largest dam in Tibet, built on river Brahmaputra, raising concerns in India over the likelihood of disrupting water supplies. The Zam Hydropower Station has been built at a cost of $1.5 billion (approximately Rs 9764 crores). 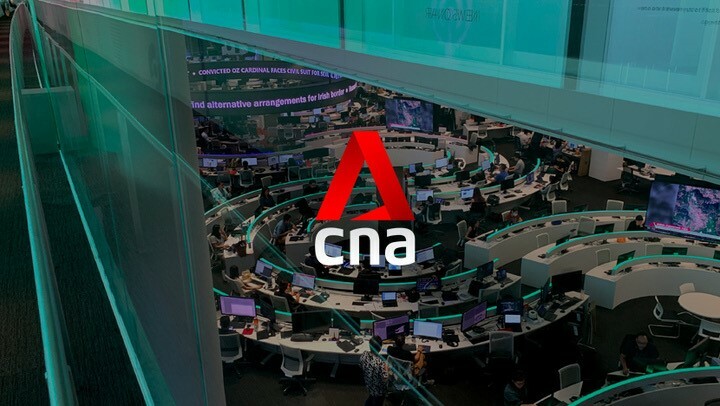 All six of the station’s units were incorporated into the power grid today, the China Gezhouba Group, a major hydropower contractor based in Wuhan, capital of Hubei Province in central China, told state-run Xinhua news agency. Located in the Gyaca County, Shannan Prefecture, the Zam Hydropower Station also known as Zangmu Hydropower Station, harnesses the rich water resources of Brahmaputra – known in Tibet as Yarlung Zangbo River – a major river which flows through Tibet into India and later into Bangladesh. The dam, considered to be the world’s highest-altitude hydropower station and the largest of its kind, will produce produces 2.5 billion kilowatt-hours of electricity a year. “It will alleviate the electricity shortage in central Tibet and empower the development of the electricity-strapped region. It is also an important energy base in central Tibet,” the company said. Officials said when the electricity is ample in the summer season, part of the electricity will be transmitted to the neighbouring Qinghai province, Xinhua report said. The first unit began operations last November. 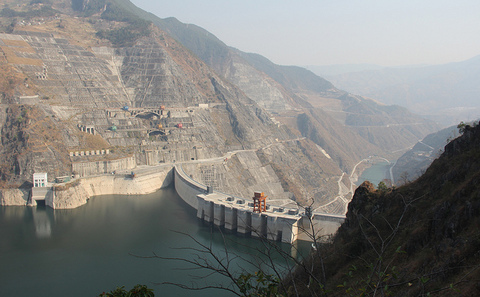 Reports in the past said besides Zangmu, China is reportedly building few more dams. 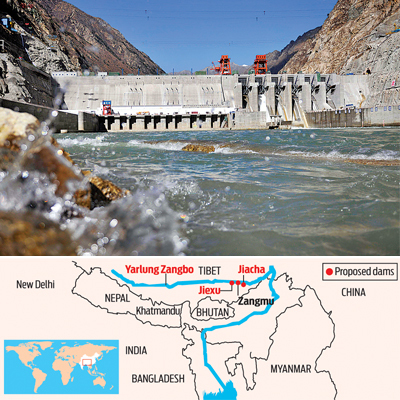 China seeks to allay Indian fears saying that they are the run-of-the-river projects which were not designed to hold water. The dams also raised concerns in India over China’s ability to release water in times of conflict which could pose serious risk of flooding. The IMEG noted that the three dams, Jiexu, Zangmu and Jiacha are within 25 kilometres of each other and are 550 kilometres from the Indian border. India has been taking up the issue with China for the past few years. Under the understanding reached in 2013, the Chinese side agreed to provide more flood data of Brahmaputra from May to October instead of June to October in the previous agreements river water agreements in 2008 and 2010. India is concerned that if the waters are diverted, then projects on the Brahmaputra, particularly the Upper Siang and Lower Subansari projects in Arunachal Pradesh, may get affected. TIBET CONSCIOUSNESS – RED CHINA – NEOCOLONIALIST – ZANGMU DAM IN OCCUPIED TIBET. 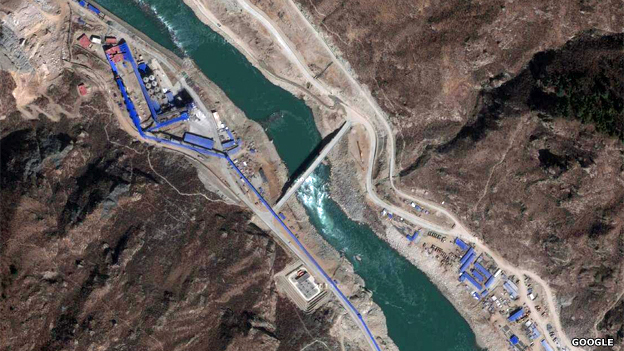 TIBET CONSCIOUSNESS – RED CHINA – NEOCOLONIALIST – ZANGMU HYDROPOWER STATION IN OCCUPIED TIBET. TIBET CONSCIOUSNESS – RED CHINA – NEOCOLONIALIST – LOOT AND PLUNDER OF NATURAL RESOURCES IN OCCUPIED TIBET. TIBET CONSCIOUSNESS – RED CHINA – NEOCOLONIALIST – COLONIAL EXPLOITATION IN OCCUPIED TIBET. TIBET CONSCIOUSNESS – RED CHINA – NEOCOLONIALIST – CONSTRUCTION OF HYDROPOWER DAMS IN OCCUPIED TIBET. TIBET CONSCIOUSNESS – RED CHINA NEOCOLONIALIST – ZANGMU HYDROELECTRIC PROJECT IN OCCUPIED TIBET. TIBET CONSCIOUSNESS – RED CHINA – NEOCOLONIALIST – COLONIALIST EXPLOITATION OF GREAT RIVERS OF ASIA IN OCCUPIED TIBET. TIBET CONSCIOUSNESS – RED CHINA – NEOCOLONIALIST – COLONIALISTIC EXPLOITATION IN EARTHQUAKE PRONE REGION OF OCCUPIED TIBET. TIBET CONSCIOUSNESS – RED CHINA – NEOCOLONIALIST – RED CHINA TAKING CONTROL OF ASIA’S WATER TOWER IN OCCUPIED TIBET. TIBET CONSCIOUSNESS – RED CHINA – NEOCOLONIALIST – HUTOSHAN RESERVOIR IN OCCUPIED TIBET. TIBET CONSCIOUSNESS – RED CHINA – NEOCOLONIALIST – RED CHINA’S COLONIALISM IN TIBET WILL IMPACT INDIA AND BANGLADESH. Tibet Consciousness – Red China – Neocolonialist. Zangmu dam in Occupied Tibet.